The site is awesome. I've started collecting USSR cameras recently, and this site was a big help to me! I've died and gone to heaven! 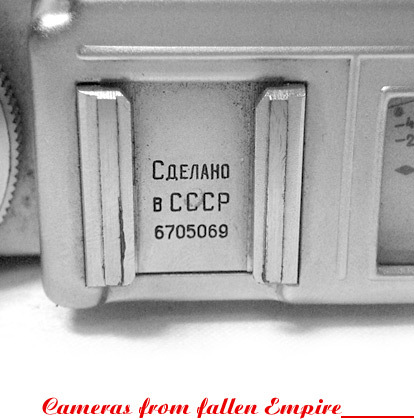 I've just started collecting old Soviet cameras - so this site is an invaluable resource. This is the most complete work to show almost all the old Soviet Russia's photography cameras and exposure meters. Well done to the author and to his contributors. Does anyone offer a KMZ Foton Camera? Świetna kompleksowa strona!!! Wychowałem się na Waszych aparatach!!! Przydałoby się polskie tłumaczenie. Un sitio web fantástico donde aprender mucho sobre las cámaras soviéticas tan desconocidas para nosotros en España. ¡Enhorabuena! A great reference site. I've just picked up a Smena-8 branded Cosmic 35 (Serial No. 258294) with the Gomz logo on the lens and a plain circle on the back. Original case also has the Gomz logo. Many thanks for putting this wonderful webpage together, it's just allowed me to identify the Lubitel-2 I purchased off of eBay as a type K1365, serial number 003722. Once again, thanks! Dear Aidas, it is always a pleasure to visit your most beautiful homepage. It is simply outstanding! With my best wishes, yours, Milos. Aidas, Many thanks for the help and also many thanks for the most impressive web resource you have developed! Thank you for making this website! Very informative, fascinating stories and history. I have several FSU cameras. FED5 and 5B, Zenit11, Chaika3, Kiev35a, Leningrad and Kiev 88. I love them all! Thanks again. Mark.